The Passo Fedaia is located at the foot of Marmolada, with 3343 meters the highest peak in the Dolomites . During the First World War the front between the Italian and the Austrian army ran across the glacier on the north side of the mountain. For the supply and for shelter tunnels were cut out in the ice. Many soldiers fell victim to snow avalanches. 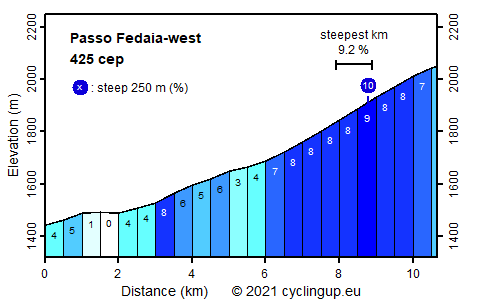 One could divide the climb from Canazei to Fedaia in three parts. The first three kilometers until Penia are very easy (0-5%). At Penia the, for some time, last buildings are left behind and with some long turns one enters into the middle section where the slope increases to between 3 and 8%. More than three kilometers further on, the road leaves the valley bottom and the final part with a slope of mostly 8% begins. First, the road winds itself up with four hairpin bends. What follows is a three-kilometer-long traverse, in which the view becomes more and more beautiful. The ascent ends at the dam of the reservoir (Lago di Fedaia). It is still worth to cycle along the lake because of the view of the Marmolada, its glaciers and the lake itself.